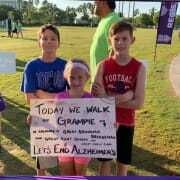 Join our Walk to End Alzheimer's Comm ittee in Collier County (Naples) Florida, Lee County (Fort Myers) Florida, or Charlotte County (Punta Gorda) Florida. You will work with passionate people who are dedicated to fighting for the first Alzheimer's Survivor. There are opportunities to suit all interests and skill sets - and we have a lot of fun while doing rewarding work to advance the cause. 5 - 10 hours a month.